Synthetic GRP conjugated to BSA by a Glutaraldehyde linker. Our Abpromise guarantee covers the use of ab22623 in the following tested applications. GRP stimulates gastrin release as well as other gastrointestinal hormones. Operates as a negative feedback regulating fear and established a causal relationship between GRP-receptor gene expression, long-term potentiation, and amygdala-dependent memory for fear. Belongs to the bombesin/neuromedin-B/ranatensin family. ab22623 at a 1/1000 dilution staining mouse brain (SCN region) by Immunohistochemistry (Formalin fixed sections). The antibody was incubated with the tissue for 16 hours and then detected using an Alexa-Fluor® 488 conjuaged donkey anti-rabbit polyclonal antibody. 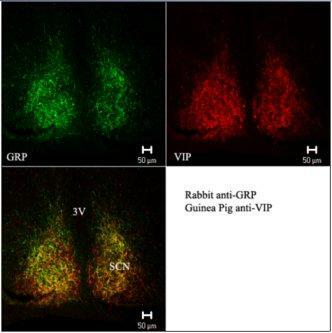 The mouse SCN region was isolated by stain with Guinea Pig anti-Vasoactive Intestinal Peptide (VIP) antibody. This image is courtesy of an Abreview by Gui-lan Yao submitted on 30 November 2005. Publishing research using ab22623? Please let us know so that we can cite the reference in this datasheet. I´d like to use the GRP antibody conjugated with Texas red (using the EasyLink Texas Red Conjugation Kit, ab102925). In that sense, do you have any suggestions about the volume of antibody that could work? In order for you to successfully use a conjugation kit such as ab102925 with an antibody that is from whole serum (such as the GRP antibody such as ab22623) you will first need to purify the antibody to remove additional proteins that the conjugate might bind to. We do have a purification kit ab102784 that is compabitible with the Easylink kits. This will remove the unwanted substances and allow you to test the concentration of the antibody at the end since it will be purified. Please let me know if I can be of any further assistance. I´m using a rabbit GRP Ab with very good results. However, I´d like to use it for a different experiment and I need to know the concentration of the stock solution. because neat serum is typically too “dirty” (extremely protein rich and too many interfering factors) to get an accurate read out. I am sorry I cannot offer you more specific information. Thank you for your email and have a nice day! P.S: will use "Anti-GFAP antibody [2A5] - Astrocyte Marker (ab4648)" also on rat cell culture by IF. The antibody include "10mM Sodium Azide" as a preservative. So, is it suitable to use on live cell staining? With regards to ab4648, I have contacted the lab to check whether the antibody has been tested in live cells and will get back to you as soon as I get an answer. Please do not hesitate to contact us if you have any more questions. Thank you for the reply! I have realized that its difficult to find an antibody for the native GRP and I will consider to bye one of your antibodies towards the whole preprotein of GRP. Thank you also for the suggested antibody for Neuromedin C, I will look it up. Conserning my questions about antibodies targeting Retinoic acid and 9-cis Retinoic acid I was not interested in antibodies towards Retinoic acid receptors (RAR α, β or γ) or 9-cis Retinoic acid receptors (RXR α, β or γ) those I know you and other company have many of. I was looking for antibodies towards the proteins Retinoic acid and 9-cis Retinoic acid, but I guess these are not availible because I have been searching for this alot. All of the suggested RA antibodies are for RA receptors. Thank you for your reply. I am sorry that I could not be more helpful in your search for antibodies towards the proteins Retinoic acid and 9-cis Retinoic acid. If I do find any I will send that information along to you. If there is ever anything that I can help you with, please do not hesitate to contact me. To how it might concern I am looking for an antibody towards human Gastrin releasing peptide (bombesin), recognizing only the 27 amino acid long native protein of GRP (aa 24-50), not targeting the whole 148aa preprotein (also commonly called GRP, but including a signal peptide, a propeptide and cleaving products GRP and neuromedin C). I saw that you have several human GRP antibodies on your homepage e.g. rabbit polyclonal "anti-gastrin releasing peptide" (cat.number ab22623), but I can not see if these antibodies target only the native GRP or the pro-GRP. If any of your anti-human GRP antibodies targets the native GRP I would be very greatful for that information! If you also have any suggestion for an antibody recognizing native human Neuromedin C (aa 41-50) that would also be much appreciated. I am also looking for an antibody targeting human Retinoic acid and one targeting human 9-cis Retinoic acid. These should preferably work for both Western Blot, IHC and IF. If you have any of these antibodies I would be very happy for the information. Thank you for contacting Abcam. I have looked at all of the Gastrin Releasing Peptide antibodies in our catalogue and they are all polyclonal raised against the full length (148aa) protein. Therefore I cannot guarantee that any if they will be able to recognize on the 27aa native GRP. We have one Neuromedin C antibody that does recognize the sequence between aa41-50 and that is ab48610. For Retinoic acid, we have several in our catalogue depending if yo wish to detect the alpha, beta or gamma. These include ab28767, ab53161 and 97569 and they all work in at least two of the applications that you specified. I could not find anything in our catalogue for human 9-cis Retinoic acid but if I do find anything, I will pass that information on. If there is anything I can help you with, please let me know. Thank you for getting back to me. The following website has a great dot blotting protocol: http://www.westernblotting.org/dot%20blot%20protocol.htm I hope this information helps, please do not hesitate to contact us if you need any more advice or information. Thank you for your enquiry. Gastrin Releasing Peptide antibody (ab22623) has yet to be tested by western blotting. However, according to the SwissProt entry (P63153) the predicted molecular weight of porcine Gastrin Releasing Peptide is 2.8KDa. I would therefore advise you perform a dot blot rather than electrophoresis as a protein of this size will be very difficult to analyse by electrophoresis. Can you please tell me the approximate size of the gastrin-releasing peptide? Thanks!